Probably one of the most common questions asked at an Italian deli counter in America is, "What is prosciutto?" and nine times out of ten, the inquirer will mispronounce the Italian word. Although prosciutto has been around for thousands of years, since early Roman times, and has always been an Italian favorite, it only gained popularity in the United States in the late 20th century. Despite its exotic name, prosciutto is just ham. Granted, it's one of the tastiest hams in the world and comes from pigs and boars fed special diets but, at the end of the story, it's still a cured leg of pig or boar. Literally translated from Italian, prosciutto means "to thoroughly dry," which refers to the drying part of the curing process. Prosciutto is available either raw or cooked. The raw version is the most popular and while it is not actually cooked, it is salt and air cured and does not require additional cooking before consumption. In fact, cooking it will make it tough and undesirable to the palate. Cured, uncooked prosciutto is prosciutto crudo. 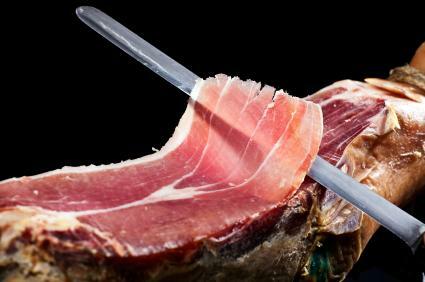 The most popular type of prosciutto sold in the United States is Prosciutto di Parma, sliced paper-thin before serving. Parma refers to the region of Italy in which the pigs are raised and the meat is cured. Although meat from pigs from all over Italy produces prosciutto, only a few brands qualify for exportation. Prosciutto cotto is fully cooked. Instead of the salt and air curing process used for prosciutto crudo, this ham cures in a sugar brine flavored with cinnamon, bay leaves, cloves and nitrates. The meat undergoes thorough rinsing before it is dried and pressed into a mold to keep its shape while gently simmered to doneness. Both types of prosciutto come from pampered pigs fed special diets to make their flesh most amenable to the curing processes and produce the highest quality products. The pigs' special diet is healthy and free of food scraps or byproducts commonly fed to swine. Some of the animals have special additives in their diets to enhance the taste of the meat. For example, the pigs raised in the Parma region of Italy have a diet that includes the whey from locally produced Parmigiano-Reggiano cheese. Before curing, the pork legs are trimmed of fat and skin. Curing the meat in different ingredients and conditions imparts it with various flavors. Prosciutto made in the San Daniele area of the Friuli region of Italy is lightly seasoned with salt from the surrounding sea and the hams are stacked atop each other during the curing process. Like the Parma version, this ham falls into the "sweet" ham category. The "savory" ham produced in the Toscano area of Tuscany uses a cure made from juniper berries, salt, pepper, rosemary and garlic. Curing can take anywhere from one to two years, depending on the method used. Prosciutto is such a pretty food, it can serve as a garnish as well as part of appetizers or main dishes. The most popular appetizer presentations include wrapping a piece of the thinly sliced ham around a piece of melon, as the saltiness of the meat accentuates the sweetness of the fruit. It also pairs well with fresh mozzarella as part of an elegant picnic basket menu and turns fresh figs into an appetizer table star. Prosciutto also makes a great pizza topping as it lightly crisps and browns atop the other softer ingredients. Now that you know a little about the history of this delicate treat, the next time you hear the query, "What is prosciutto?" you can answer with confidence and with a little peek at a dictionary, also proudly and properly pronounce the word.